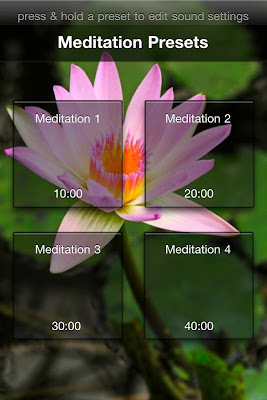 A while back I wrote a review on Meditate - Meditation Timer by SimpleTouch. You can find that review here, but just recently they released an update for the app. Since my initial review was so glowing, I was very concerned when I saw the added functionality of the app. The App Store page showed that it had new timers, new bell tones, in-app purchases, and more. I immediately feared that they had tried to reach beyond the simplicity of the single purpose app and in so doing feared that they had destroyed it's perfection. If there was anything at all wrong with the original, MondoSamu readers seemed to think it was the lack of bell sound variations. For me this wasn't an issue as I very much enjoyed the high, clear Tingshas tone that the app used. A few people said they preferred lower, richer tones. I can certainly understand, but felt it was a minor flaw, if one at all. However, that is precisely one of the things that SimpleTouch has overcome with the release of the update. Basically, the app still works flawlessly and amazingly as it did before, but they found a nice, subtle way to include the new functionality. As before, when you tap on the app, you get the main interface (used to be the only interface) for executing your meditation. You have the "Meditation" duration at the top with that button highlighted, the "Preperation", Interval, Cool Down and plus/minus buttons as well as the "Meditate" button that starts the timer. What's different is that you now have a tiny grid, remarkable only for it's subtlety, in the bottom left corner. Thoughtfully, this grid represents which of the four presets you are using. If you tap that grid, the screen recedes to the back, while four buttons merge to the front. 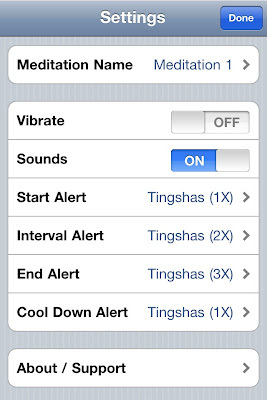 This new screen is called "Meditation Presets". Beneath the "Meditation Presets" header, are four buttons. Meditation 1-4. At the bottom of each button is a duration for that meditation. You can tap on any one of these to get the main interface again, but if you tap and hold on one of the buttons you get a screen that slides up to reveal the settings for that preset timer. It saves them on the fly. What this does for you is allow you to have different meditations that you use for different times throughout your day. Perhaps, like me, you only have time for a 15 minute meditation in the morning (you can rename this to "Mornings"). If so, then just tap that button and the timer for that meditation comes up. 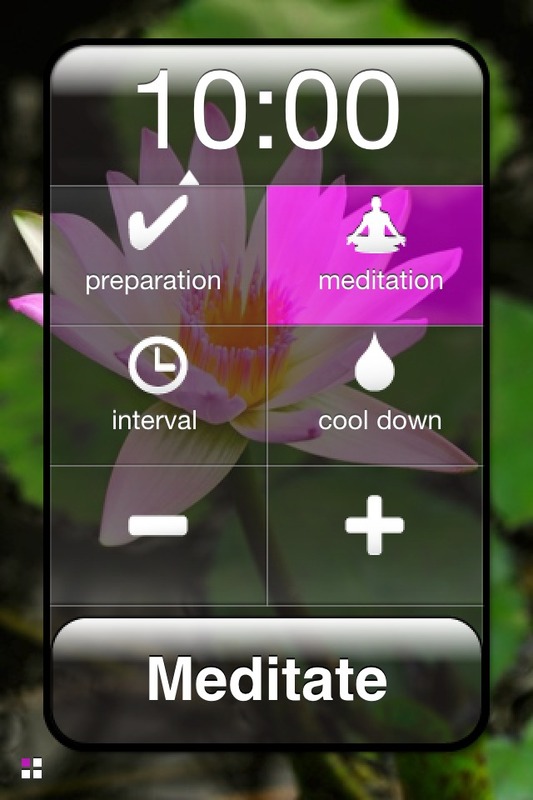 Or maybe at lunch you grab a quick 30 minute meditation…there's a button for that as well. The very meaningful and thoughtful way that SimpleTouch achieved this fairly complex amount of control is by having you tap and hold on whichever of the preset buttons you want to tweak. Once you do this, a screen slides up to reveal the controls for that meditation. From here you can change the name of the meditation, turn on-off the vibrate, set the sounds on or off, configure your various bells AND this is where you get to set the bell tones. 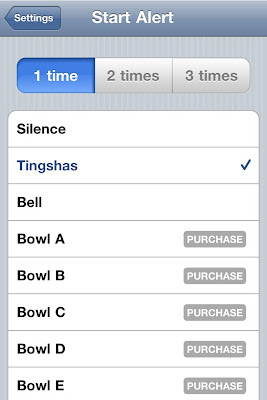 You tap on those and another sliding screen appears with options for how many chimes, which tone (where you can also download tones in-app to suit all your tonal needs) and - and this is another minor thing they have addressed from the original version - you can set the bell to SILENCE! I had received a couple of comments that people found the bell DURING meditation to be distracting and didn't really see the point. For me, it's great because I have one sound at 5 minutes and use that first five minutes to still my mind, then when it sounds I slide deeper in to my meditation. But, some wanted silence, and now that is a choice! Anyhow, this is an astonishing amount of control that - while I didn't think it was necessary - SimpleTouch found a way to incorporate all of this intricate detail while still keeping "Meditate" VERY simple, elegant and agile! I would like to see it go "Universal" so it works full screen on the iPad, but hopefully that's in our future! It does have some great new backgrounds as well, by the way. So, I say "Whew! Good job, SimpleTouch!" If you have a need for a meditation timer, I can't recommend any app as being remotely as good as this one for the job, and that's saying a lot because there are plenty of good ones out there! Now I need to meditate!